Devastor 2 is a compact distortion that produces outrageous sounds you can't ignore at a price you can't resist. Awesome sound. Lovely GUI. Lush filters. Well crafted presets. Effective routing options. D16's SilverLine range of plugins - inspired by the sound and features of vintage digital and analogue kit in the broadest sense - strikes a superb balance of quality and affordability, and one of its early standouts was Devastor, a multiband distortion effect. It had three filters, each of which could be placed (in parallel) before or after a diode clipper - and that was pretty much it! No panning controls, no mid/side or left/right processing, nor frills of any kind, besides a simple dynamics section. It was simple and it sounded divine. On the surface, not a lot has changed in Devastor 2 (VST/AU/AAX), but first impressions can be deceptive. The optional volume leveller (Dynamics) comes first. Effectively a single-dial compressor with auto-gain, this flattens the signal before it hits Devastor 2's clipping stage, preventing the distortion character from fluctuating with the signal level. The algorithm has been tweaked since v1, and its most noticeable on transient- heavy material, giving punchier, tighter results. Next comes the Diode Clipper, modelled on an analogue diode clipping circuit. This creates distortion by clipping the top and bottom of the waveform according to one of six selectable curves. Three knobs control the clipping: Preamp dials in up to a whopping 48dB of gain; Threshold defines the level - from -48 to 0dB - at which distortion kicks in; and Shape adjusts the underlying properties of the selected clipping algorithm (of which there are six). The Diode Clipper is unchanged from v1, and still sounds great - even without applying any of the filters, Devastor is a useful distortion tool. The three filters each have Volume, Cutoff, and Resonance/Bandwidth controls, and a choice of High-Pass, Low-Pass, Band-Pass, and Band Reject. They've been improved since v1 and now sound truly lush and 'analogue', particularly in the new high-quality modes (four settings, from Draft to Ultra, assignable separately for online and offline processing). The filters' range has been expanded, now ranging from 20Hz to 20kHz (up from 12kHz), but sadly there are still no modulation options. Filters this good are crying out for LFOs. Another big change is that the filter Pre/Post switches are gone, replaced by nine preset topologies. Ranging from simple to complex routings, these might seem arbitrary on paper but they make sense in use. Last in the chain comes a dry/wet mix dial (FX), the Output Meter and Output Volume control, and, new to v2, a handy on/off limiter. For such a simple plugin, Devastor 2 produces a wide variety of effects and sounds great on almost any signal. 94 presets showcase some of this potential, but you can take it much further. 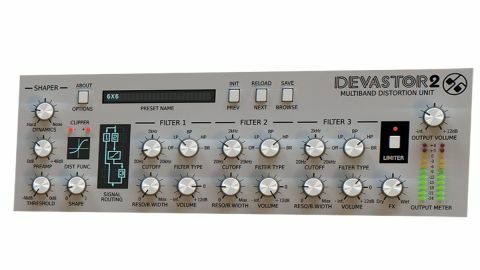 In our review of Devastor 1, we said we'd like to see a clipping stage for each of the three filters, for true multiband distortion, but in the intervening years we've grown to appreciate the simplicity and efficacy of the results. The simple design is typical of the SilverLine range's ethos and part of its charm, like the analogue gear that inspires them. Devastor 2 improves on an already excellent plugin. Whether used for stylised mixing effects (broken radios, damaged megaphones, etc), parallel-processed oomph, aural excitement or straight up signal-crunching, it's a powerful weapon with many applications in every genre. Just be aware that if modulation is on your checklist, you'll need to look elsewhere.